Home Local News Opinion: Is Flash Flooding Triggering Irmaria Flashbacks? St. Thomas clinical psychologist Nour Suid weighs in on the psychological impact of heavy rains a year after two devastating hurricanes threw Virgin Islanders’ lives into chaos. Hurricanes Irma and Maria occurred over one year ago and Virgin Islanders are still having intrusive thoughts every time it rains. Some even have flashbacks and feel like they are reliving the two catastrophic hurricanes. It used to be nice to get a little rain here and there on the island, and see the beautiful rainbows afterwards. 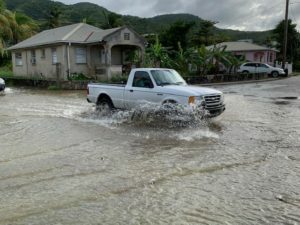 Now, every time a drop of rain falls, Virgin Islanders begin to think about all the flooding that occurred and houses and businesses that didn’t get repaired. The countless stories of Virgin Islanders who have been traumatized since the hurricanes are heartbreaking: a mother who described holding her two newborn babies in her arms as the roof blew off; the man who said he thought someone was knocking at his door but when he opened it a tornado entered like an unwanted guest on a path of destruction; the little island boy who gets frightened when he sees rain coming and begs his mom to take him home because he is terrified another hurricane will come; the lady who still screams in her sleep because she hears the loud rain and strong winds out her glass windows as she begins to have flashbacks and relive the experience of Hurricanes Irma and Maria. “It took a while to grasp it. At first, everything seemed broken and maybe even unfixable,” said Megan Bryan, who went on to reflect on what is so special about being a Virgin Islander, and how beautiful it is when the community comes together and helps one another. “We are such a humble community…And I think a true Virgin Islander spirit is unbreakable… We are V.I strong,” she added. To this day, many islanders are still in distress, with many experiencing symptoms of Post- Traumatic Stress Disorder (PTSD). Symptoms for PTSD may include but are not limited to: having intense feelings when reminded of a trauma; flashbacks or feeling like trauma is about to happen all over again; nightmares; avoiding certain places, thoughts, feelings or activities that remind the individual of the trauma; and having physical reactions when reminded of the trauma. Many Virgin Islanders had to say their goodbyes as their close friends and family left. Even locals who were off island, but had family and friends living on the island recall the agony of having to wait for hours, or even days to hear back about the safety of their loved ones. If an individual is experiencing symptoms of PTSD, and it is interfering with their daily routines, then they should seek help. Individuals react and experience to the different symptoms differently. I think it is crucial for people to remember that PTSD is not a sign of weakness, and even the strongest individuals can get it. The Virgin Islands has several psychotherapy practices that are here to support. All of these offices accept most insurances, government workers with Cigna reaping the benefit of services being covered at 100 percent. Sometimes it helps to come in, even if it is for just one appointment, to be in a safe space and be heard in a setting where anything you tell a therapist is confidential. It is crucial for individuals to know and understand that they are never alone. There is always someone out there who wants to help. Yes, healing can take some time, but the first step begins with you, and asking for help is a courageous step to take when moving forward. Nour Suid was born and raised in the Virgin Islands. She earned her doctorate in Clinical Psychology at California Southern University.